and citizenship skills that will influence them positively throughout their entire lives! Grand Island Boy Scout Troop 510 is part of the Greater Niagara Frontier Scout Council. We meet every Thursday evening from 7:00 - 8:30pm. 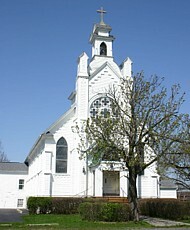 at 'Old' Trinity United Methodist Church, 2100 Whitehaven Rd, Grand Island, NY 14072. We are a very active Scout Troop, contributing to our community, and also taking part in many camping and other local events organised by our Troop or within our Council, and also more distant events organised under the auspices of the broader Boy Scouts of America movement. Scouting goes beyond the scope of most youth sporting activities by providing a sense that we are all important as individuals. The Scouts in our Troop value each other and each other's contributions, regardless of whether we win or lose a game or a competition. Our Scouting Program also provides specific activities that promote personal responsibility and elevate self-esteem. As a result, when hard decisions must be taken, and peer pressure must be resisted, the right choices can be made. And Building Friendships, Memories, & Positive Core Values That Will Last A Lifetime!